An artist’s concept of the new Milwaukee Bucks arena. The governor, legislative leaders, and local leaders are expected to announce a Milwaukee arena financing plan this afternoon. AUDIO: Walker said the area is important for the entire state of Wisconsin. The governor had proposed borrowing $220 million to help finance the $500 million project, but Republican leaders aren’t on board with that, saying city and county government should take on a greater share of the cost. Walker included the bonding plan in his two-year budget, but he’s OK with addressing the arena as separate legislation. He met with legislative leaders Wednesday. 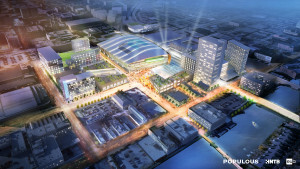 Walker will hold a press conference this afternoon at his Capitol office with more details on a long-awaited plan, which is part of a billion-dollar multi-purpose arena and sports and entertainment district to help revitalize downtown Milwaukee. The plan includes restaurants, bars, and office space on up to 30 acres of land.